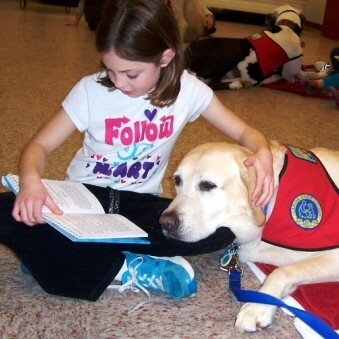 Clever Canines Therapy & Obedience Club has teamed with the Colonial Heights Public Library to enhance children's love of reading through the Clever Canines' Book Buddies Program. This program will take place on Monday, April 8, 2019 and Monday, June 10th, 2019 from 6:00 pm to 6:30 pm for elementary school children. Children participating in the program have the opportunity to come to the library to read to registered therapy dogs (and their owners). All dog and owner teams have successfully completed the AKC’s Canine Good Citizen Test and the Therapy Dogs Incorporated Test and regularly visit nursing homes and assisted living facilities. Research shows that children who are learning to read feel more relaxed and less self-conscious when reading to dogs. The program aims to improve reading skills, nurture a lifelong love of reading, and help children build bonds with dogs. Register online at the link below. Call the library at (804) 520-9384 with any questions.